Download 2019 ELA application details here. 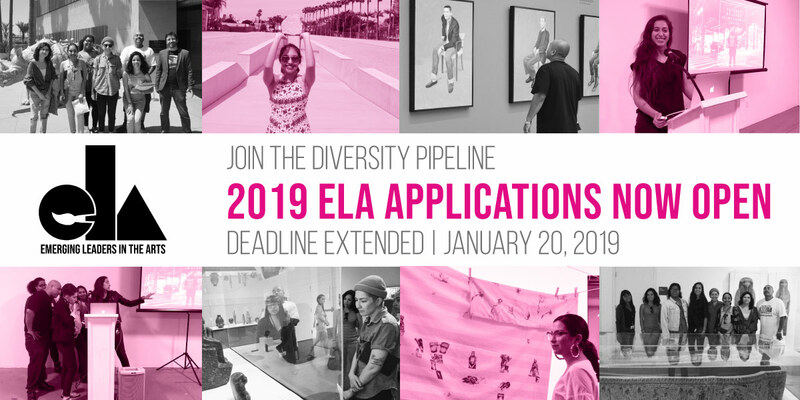 The 2019 ELA application deadline has been extended to Sunday, January 20, 2019. Please note that all selected 2019 ELA Fellows are required to attend the first ELA meeting on Wednesday, January 30, 2019. Emerging Leaders in the Arts (ELA), a program conceived of and facilitated by Museum of Contemporary Art Santa Barbara (MCASB) and funded by the Walton Family Foundation and the Ford Foundation, demonstrates to young individuals who identify as people of color that pursuing and securing curatorial and museum leadership roles is not only possible but achievable and necessary in order to preserve and elevate the cultural perspectives of our rapidly-changing diverse local community and beyond. By providing a content-rich year long professional development program for existing MCASB interns, junior staff members, and local college and high school students, the Museum intends to outline a pathway toward curatorial and museum leadership for underrepresented sectors of our community. This year’s Emerging Leaders are local to Santa Barbara and have been previously connected to MCASB in various capacities. The high school students involved have previously participated in MCASB’s Teen Arts Council and are currently enrolled in the Visual Arts & Design Academy (VADA) at Santa Barbara High School. The college students have either interned at MCASB as Community Engagement Representatives or have previously served as arts preparators at MCASB. The remainder of the participants are current junior staff at MCASB. Participants’ ages range from 16 to 39. High School Students - ELA participants currently enrolled in high school are required to curate and install a week-long exhibition opening in October 2018. 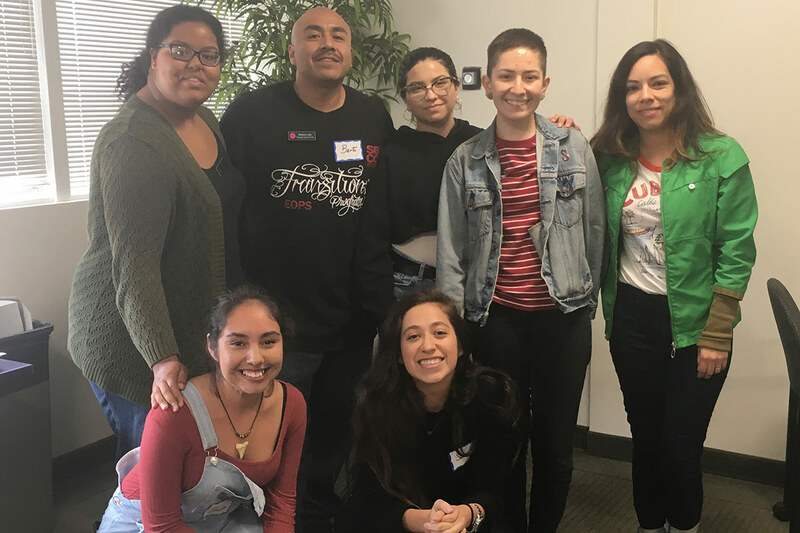 College Students - ELA participants currently enrolled in college will formulate a project geared towards increasing diversity and inclusion for the arts within the SB arts community. MCASB Junior staff - ELA participants that are also MCASB staff will envision and support a project within the museum that encourages diversity and inclusion within the arts community. January: Orientation to ELA program. Meet with MCASB Curator and Director and program partners and discuss historic and current underrepresentation of people of color (POC) in the arts. February: Meet with Communications Manager to discuss brand for ELA. Discuss readings about diversity and inclusion within non-profits, boards, and upper-level museum positions. March: One-day retreat to serve as the foundation for the diversity, equity, and inclusion part of the ELA program where participants will learn common language for discussing issues of diversity, equity, inclusion, and cultural relevance with a focus on how these issues have played out in each participant’s life and in the arts world. April: Field trip to LA to meet with curators and arts professionals at museums and relevant institutions. Tours of LACMA, MoLAA, Vincent Price Museum, and MOCA. Will speak with Chon Noreiga, Head of Chicano Studies at UCLA and adjunct curator of LACMA; and Gabriela Padilla, Student Museum Educator of Vincent Price Museum. After the field trip, meet to review the topics covered during the trip and have a discussion with Just Communities about cultural relevance and cultural responsibility. May: Sarah Dildine will provide a ‘ Staying In The Know’ course explaining the importance of keeping up-to-date with art news and current artists. Discussion with Just Communities about creating language inclusive art spaces. June: Montecito Bank and Trust will provide Financial Literacy Training. Just Communities will lead a discussion on building a diverse & inclusive board of directors. July: MCASB Junior Staff and interns give 5 minute presentations about their roles in the museum and their backgrounds. Guided discussion about practicum Course Workshop. Groups, separated intergenerationally, will workshop their ideas, discuss refining, and offer solutions to the works in progress. August: Participants meet with Sarah Dildine separately to check-in about year-long projects and complete mid-year survey of the program. September: Field Trip to SF to meet with curators and arts professionals at museums and relevant institutions. Tour and talk with Chris Perez, Owner of Ratio 3, and artists on display. October: Practicum Assignment Exhibition openings for high school-level participants. Public practicum assignment presentations for MCASB Junior Staff and one college-level participant. Discussion, questions, and reception to follow. November: Public practicum assignment presentations for two college-level participants and high school-level participants. Discussion, questions, and reception to follow. December: Participants meet with Sarah Dildine separately to check in about year-long projects and year-end survey of the program. Partners and interested guests/tour guides meet with Sarah Dildine for a year-end survey.